Whether you’re an Irish descendant or a fond admirer of all things Celtic, choosing an authentic Irish baby name can be downright fun. From its early clan system to Anglicization, and devotion to ancient mythology and Catholicism alike, Irish names are complex and rich with history. Just in case you’re new to Blunders in Babyland, my baby name lists revolve around a common theme: I like names that are unique and meaningful. Every baby is so special and I believe his name should match! If you’re like me and love the idea of finding unique Irish boy names for your unborn Celt, then read on! Just a quick note before we dive in! As search through Irish baby boy names, probably notice that a few have interesting spellings and even more interesting pronunciations. Names like Siobahn, Bebhin, or Bógáin are more closely related to the original Gaelic variations. Since Ireland came under English rule in the 16th century, many of these names were anglicized. Most of the time, that meant shortening or altering the name to its phonetic version. The list below contains both Gaelic names and phonetic versions, with pronunciations as needed. This unique Irish boy name has roots in both Arabic and Gaelic. In Gaelic, however, it means “little abbot”. If your religious terminology is a little bit fuzzy, an abbot is the head monk at an abbey. (Shay-lan or Kay-lan). Just like its varied pronunciations, Caelan has multiple meanings. In some situations, it means “slender” or “child”. In others, it means “mighty warrior” or “victorious people.” The name is now considered unisex. This is probably one of my favorite Irish baby names on this list. It means “fierce bravery”. Not only can it embody your unborn baby’s developing temperament, but its a great motto for him to live by. You might be more familiar with the phonetic version of this name, “Deermot” or “Dermot”. Diarmuid has a rich history in old Irish mythology. He was the demi-god lover of Grainne, the daughter of the High King Cormac mac Airt. In the legend, Diarmuid and Grainne run away together, ruthlessly pursued by her elderly betrothed, Finn mac Cumhaill. In the end, Diarmuid meets an untimely demise, but his character was fearless and admirable. SHORT ON TIME? PIN THIS TO YOUR BABY NAMES BOARD! Pronounced exactly as it sounds, Hagan is the anglicized version of the surname O’Uiginn, which means “viking”. PSSST! Are you ready for your baby to arrive yet? No? Check out our Pregnancy Class Guide. You’ll be glad you did! There’s some debate as to whether this is a Scottish name or an Irish name, however, it means “supplanter”. It’s most likely derived from James. Keiran is the phonetic version Ciaran, which means “dark.” The name gained its popularity from the Irish saints, Ciaran the Elder and Ciaran the Younger. Pronounced and often spelled, Neal, Niall rightfully means “warrior” or “champion.” Niall comes with an incredible, bordering on fantastical, history; High King Niall created a dynasty that ruled Northern Ireland for four centuries. Quillan is a cool variation of Collin. Torin has a variety of meanings and origins, depending on how its spelled. The Irish varation, Torin, means chief from the crags. The English version, Tauren, means woodland. A variant of Taveon, Veon means hillside or sky. Like Phelan, Whelan is a variant of the Gaelic name, Faolán, meaning wolf. When you’re searching for your baby’s name, you’re not just looking for something that sounds nice. You want to find a name that not only speaks to your heart, but your child’s bright future and personality. Without meeting your child, that can be quite the challenge. 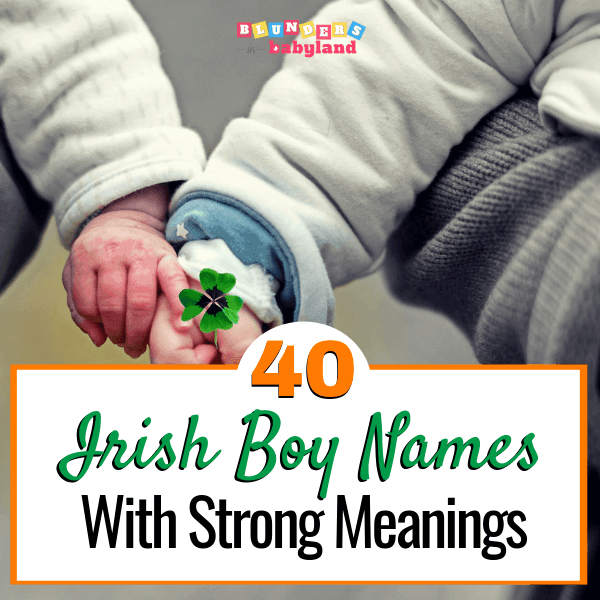 The Irish boy names above are beautiful, yes, but they’re also timeless and special. Whichever one you choose, you know that his name will be as unique as he is. If one of these names just didn’t speak to you, check out our other baby names posts. I created Blunders in Babyland for new and expecting moms that want to thrive during the early motherhood phase. If that’s you, check out a few of our most popular posts. I think you’ll love them! Good luck with the baby name search, Mama!